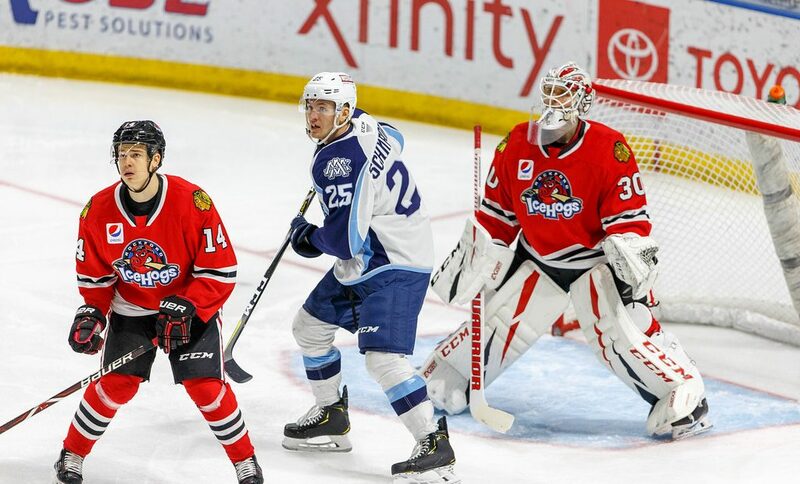 The Rockford IceHogs, Chicago’s AHL affiliate, wrapped up the 2018-19 season last night against Milwaukee. The Hogs were beaten by the Admirals 3-2, concluding the IceHogs season with a 35-31-4-6 mark. The 80 points earned by Rockford placed them seventh in the Central Division, out of the playoff picture this season. As often happens with April snowstorms, I opted for my basement over the BMO Harris Bank Center to watch the curtain fall on this year’s crop of prospects. What follows are my thoughts as the piglets finished this season Sunday evening. Looks like a less than full throttle bunch to close out the season. Hogs MIAs include Peter Holland, Matthew Highmore, Jordan Schroeder, Jacob Nilsson, Dennis Gilbert, Lucas Carlsson, Collin Delia and Anton Forsberg. Kevin Lankinen is starting in goal; Matt Tomkins is backing him up. Apparently, with no tomorrow for Rockford, the Hogs have decided to punt. Perhaps that’s a bit harsh; obviously, the brass want to see some of the newer faces take to the ice. Milwaukee, meanwhile, is gunning for the second seed in the Central Division. Back on March 22, the Ads were five points behind Rockford for the fourth playoff spot. Milwaukee has gone 9-0-1 since. The IceHogs went 4-6 in their past ten games. Rockford beat the Admirals in overtime Tuesday in Milwaukee. They fell 3-0 in Iowa Saturday night; it was the seventh time this season that the piglets have been shut out this season. Right to the end, goals were too scarce for this bunch. The Lankinen-Tomkins connection could be a preview of the goalie tandem next fall, though it’s very possible a veteran will be obtained to pair up with Lankinen, who was very good in limited opportunities for the IceHogs. He definitely needs 40 starts in Rockford instead of the 18 he got this season. Highmore, who spent most of the season recovering from shoulder surgery, left Tuesday’s game and hasn’t played since. Last year’s top goal-scorer suffered through a disappointing season. Hopefully he’s just being held out to keep him healthy and his summer can be spent getting ready for a more productive campaign. Defensive Player Of The Year-Lucas Carlsson, who isn’t playing tonight. My Pick: I had Carlsson, who led Rockford defensemen with 33 points (9 G, 24 A) this season. Most Improved Player-Dennis Gilbert, who isn’t playing tonight. My Pick: Gilbert, who really added to his physical game throughout the season at both ends of the ice. My Pick: Jacob Nilsson, who had a promising rookie season, with 15 goals and 18 helpers in 62 games. Sikura was an outstanding rookie for the IceHogs; my selection of Nilsson was largely because he spent the bulk of the season in Rockford, as opposed to Sikura, who played 49 games. My Pick: Andrew Campbell, who anchored this young team despite not putting up the points. His three-goal, five assist season was what I expected offensively from Campbell. I also expected a strong veteran presence, which Campbell more than delivered. Heavy Hitter-Andreas Martinsen, who isn’t playing tonight. My Pick: Gilbert, who put a lot of butts on the ice during the season. He also dropped the gloves seven times to pace the club. My Pick: The team announced this a while back, so we all knew how this would go. I really hope Pelletier, who missed the first couple of months, is back with the IceHogs for a third season. His motor is a definite asset. Team MVP-Jacob Nilsson, who isn’t playing tonight. My Pick: Jordan Schroeder, who also isn’t playing tonight after being injured last weekend. All Schroeder did was set a career-high in points with 45 (19 G, 26 A) and score 19 goals for Rockford. With points in 37 of his 62 games, Schroeder’s longest point drought was three games. He had points in 23 of those games, including the Hogs only hat trick against Iowa January 6. However, Schroeder was a steadier scoring threat for the offensively-challenged Hogs. On a team that was woefully short on veteran scoring, Schroeder stepped up his game. He was consistently Rockford’s most productive offensive player all season. In my opinion, this was the team’s biggest miss in regards to the awards. Tanner Jeanneau puts Milwaukee up 1-0 with a tip-in at 6:29. A couple minutes later, Milwaukee scores again on a power play goal by Cole Schneider. Just over eight minutes in and Rockford trails by a pair. The Hogs get a goal back when Alexandre Fortin knocks in a centering pass by Dylan McLaughlin midway through the frame. Fortin has had difficulty converting on scoring opportunities this season (this was his sixth goal of 2018-19). The speed is there, but the kid needs to learn how to finish plays. Pelletier gets hooked a moment later and Rockford’s 29th-ranked power play hits the ice. As happens more often than not, the IceHogs come up short. Could a more effective man advantage have helped Rockford this season? Definitely. The IceHogs are out-shot 12-3 in the first 20 minutes and head to the intermission down a goal. We already know that Rockford will not be participating in the postseason. That’s because (sorry) the Hogs were not a playoff-level team. Rockford, as you would expect from a prospect-laden squad, ran very hot and cold this season. The Hogs lost six straight games on two occasions and had several three and four-game skids. Rockford did put together a six-game winning streak in late January and early February and had the goal-tending to put together a solid campaign. However, there was never enough offense to capitalize on the great play between the pipes. Hogs broadcaster Joey Zakrzewski mentions that there are 19 skaters for Rockford who will be free agents this summer. I will forecast which of those we can expect to return to the organization in the next few weeks. Tyler Sikura is one of those skaters who I would like to see back. He may not be quite the prospect that Sikura the Younger is, but Sikura the Elder can still make a difference for the Hogs next fall. His season wasn’t as productive and he lost a lot of time to injury. However, Sikura still had seven goals and a dozen assists in 50 games. The Ads go up 3-1 during some four-on-four time on a goal at 6:33 by Adam Halewka, his 21st of the season. Rockford, like last season, hasn’t let a two-goal lead get them down. This team has battled hard under interim coach Derek King. What does that mean to King’s chances of getting the gig moving forward? Rockford is on its way to a seventh-place finish. This is about how last year’s team would have fared without the slew of veterans who took over in the spring. Management is going to have to believe that King can get some of these prospects ready for action at the next level. I would think that that decision will come in the next couple of days. Fortin has a clear path to the net midway through the period; he loses the handle and another scoring chances fritters away. The shots are now 25-9 in favor of Milwaukee, who take the 3-1 lead into the second intermission. 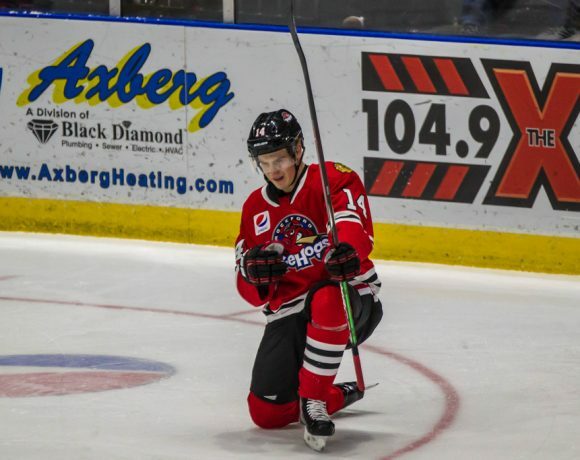 Rockford has a couple of big rallies this season, including a four-goal third period against San Antonio last week that pulled out a crucial victory at the BMO. They came back from 3-1 in Milwaukee Tuesday, so I am not counting the piglets out of this game yet. As if on cue, Luke Johnson gets a rebound of a Nick Moutrey shot into the cage at 8:57 of the third. It’s Johnson’s 18th of the season (career high) as well as his 31st point (also a career high), despite only 53 games played for the IceHogs in 2018-19. Johnson is an RFA this summer that has shown steady progress in Rockford. The Hogs refusal to capitulate has been a big selling point these last two seasons. There is a nice crowd at the BMO tonight. Not sure it’s going to be enough to prevent another drop in the yearly attendance, though. Right now, Rockford’s average is 3828, down just a tad from 3915 last season. The hockey wave may have crested, but it’s too bad more people aren’t taking an interest in a young team that plays hard and gets up and down the ice with urgency. Rockford is pressuring the Admirals as the sands begin to run out in the final stanza; they’ve out shot Milwaukee 7-2 in the first 15 minutes of the period. Johnson and Dylan Sikura each have six game-winners this season and have a lot of other clutch goals. Maybe they sneak one past Tom McCullom to knot this game. Lankinen heads to the bench and the Hogs take their last hacks. Phillipp Kurashev, who I imagine will be in Rockford full-time this fall, has a good look from the bottom of the right circle that is snatched out of the air by the Ads goalie. Time out called by King. The IceHogs win the faceoff but just can’t put that key third goal in the back of the Milwaukee net. The Admirals vault Iowa and Grand Rapids for the second seed. They’ll start with the Wild in the first round of the Calder Cup Playoffs; Chicago gets the slumping Griffins. The Hogs skate off the ice to clear out their lockers. So ends the twentieth season of pro hockey in the Forest City and the twelfth as the Blackhawks AHL affiliate. Was this season a success? My thoughts on that question (and probably many others) will come in future posts. Stay tuned.